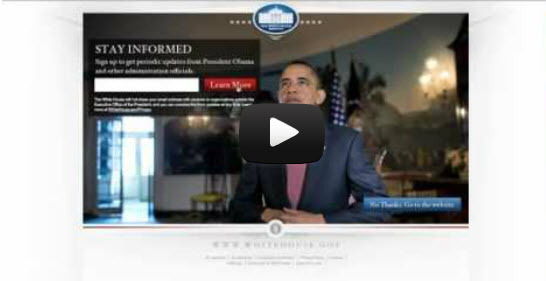 Fitness Marketing - White House Collects Leads. SO SHOULD YOU! Fitness Marketing – White House Collects Leads. SO SHOULD YOU! Hey, what’s going on, everybody? It’s your main man Seven-Figure Sam here and today I’m just kicking back in the office. I just got done talking to my boy Mike Salvietti up in Long Island, New York and he showed me something and I want to share that with you. So if President Obama is collecting emails and generating leads, I mean so should you. So what can you do like that on your website to be able to collect leads and get people on your email list? I highly recommend for you to go to WhiteHouse.gov. Go and put your name and email address there and go ahead and sign up. I already did and this way, you get the emails that supposedly President Obama or the staff will send you and I heard they probably have hired the best copywriters in the world and see how they’re writing. Why not learn from the best? If it’s good enough for President Barack Obama, it should be good enough for you. So highly recommend you go in and opt in at this site. Whether you agree with him or not, whether you’re republican, whether you’re democratic, it has nothing to do with it. This is just learning basic marketing and this is exactly how he won the last election through social media channels and through doing some internet marketing. This is pretty cool. Also if you go to this site as well, BarackObama.com, boom. Same thing. You go right there. You put your email and zip code because he wants to know where you’re at He’s going to go and start doing campaigns all around the country. So he wants to know. So, this is something that I just want to take a few minutes to show you guys and I highly recommend opting in to both of these and learning how he’s getting back and all the email copywriting. And again, what can you do to collect leads from your site? This is Seven-Figure Sam coming out to you from Chino Hills, California. Talk to you soon. Bye-bye. This is the best reason I’ve ever seen to have an opt-in and communicate with your list.